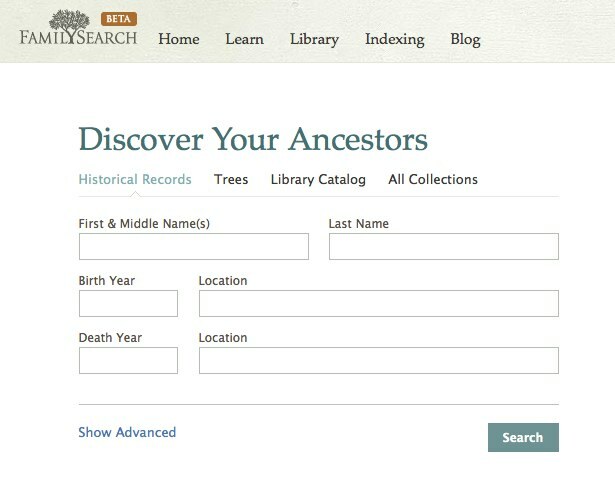 Research your family members online by accessing one of the largest databases in the world - with several million entries, New FamilySearch is one of the leading resources for genealogists. By using this service, you may be able to gather information about relatives you didn't know anything about but their birth name, birth date and their parents’ names. 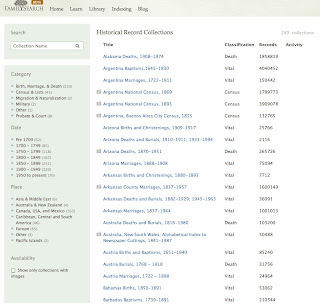 If you want to collaborate with other genealogists or family members, simply choose data to upload to New FamilySearch so anybody who researches the same person can make the connections which turned up during your research. Please be aware that New FamilySearch is currently in closed beta phase. During this phase, go to new.familysearch.org to sign up to the waiting list for immediate access. New FamilySearch is expected to be widely available to the general public by the end of 2010. Unfortunately, I quickly discovered that the connection to New FamilySearch was not fully integrated into the program. In fact, just as in previous versions, individuals are not really connected in different parts of the program. For example, if you choose a person from the Persons list, which you have to do from a search field or by scrolling through the list, and then choose the Families list, the program does not take you to the same person you just searched for in the Persons list, but starts all over again with a list of all of the families. Likewise, if you are editing a person in the Persons list, and jump to the FamilySearch tab, you are once again back to space zero, after logging in, you are not taken to the person you are editing, but have to do a search in your database again, for the same person and then look for that person on New FamilySearch. Every time. Which means that once you have located a person in your database on New FamilySearch, you have to go through exactly the same process again, to find the same person again. One by one. If you then go back to the person in the Persons list, there is nothing to indicate that you already found the person in New FamilySearch. It appears that the software developers had little or no idea how to use the connection to New FamilySearch once they established it. 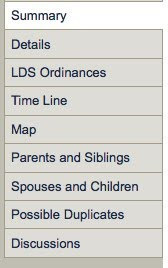 I could go on and on, like for instance the program fails to recognize the common LDS designation "BIC" which means born in the covenant. This is very significant to LDS users (the only ones interested in the designation) and is quite an oversight in the program. Apparently, hooking the program up to New FamilySearch doesn't really give much of an advantage. I am certain that my view of the program comes from using some of the existing programs (like RootsMagic and Ancestral Quest) that have fully developed New FamilySearch interfaces, but this first attempt by MacFamilyTree turns out to be quite disappointing. The graphic interface of MacFamilyTree is admirable and good for illustration purposes on its own, but after looking at the sourcing capability of the program (or lack thereof) I actually think Personal Ancestral File does a better job of sources. Now that I have all these digitized files, what do I do with them? The organization of multiple files, whether digitized or on paper, has always been a challenge. There seem to be two main camps; on the one hand there are those who want to duplicate their paper file organization on the computer, using the desktop metaphor of files and file folders. Otherwise, there are those who recognize that computers do not need a file metaphor and they use the computer to "organize" the files. Admittedly, using the computer to do the organization is pretty technical. But you might find the optimal way to organize your files somewhere between the two extremes. I assume that because the paper file/computer file metaphor is so pervasive in the graphic user interface of all of today's consumer computers, that this is the most likely way that genealogists will start to organize on the computer. In this method, you create a new file folder at some location on the computer, say for a surname, and then start putting sub-files into the surname folder. You then create sub-folders for each of the succeeding generation's surnames. In essence you are recreating the structure of a pedigree chart using the hierarchical file system of the computer's operating system. To find a document, you start down through the file structure until you identify the related surname and then hopefully, the information you are look for is located in that folder. This system is essentially the same whether you organize your folders according to surname, location, or some other criteria. Either way, you end up with nested folders related to one another due to their location in some other folder. The essence of this type of organization is spatial. I have one family in the blue folders and another in the yellow folders. Each person's virtual folder is a duplicate of what would go into a paper folder in a physical file drawer. This type of filing system is very efficient up to a certain size level. Think of a doctor's office with their filing system of multicolored tabs. The number of file folders can become overwhelmingly large. No matter how reasonable and rational your system of duplicating paper files, you will still have an unworkable system if your database is very large. For example, what if your relatives all lived in the same place and knew each other (not that uncommon)? Do you have to make copies of every document for each folder in each line, assuming the families are all mentioned in the document? (Such as a Census Page). As you can probably tell, I am not a fan of paper filing systems. I have spent too many days and months of my life looking for lost physical files. This whole system presupposes that you can keep track of what kind of file each kind of document should be filed in. But what if you have a general background document that has no specific relationship to any one file? Where does it go? Simple, you say, just create a general document file. At some point, file folders become the issue not the solution. Now, what do you do if you let the computer do all the filing and sorting? You identify each document individually with a date, and a file number (arbitrary) and key words. You then attach the documents to each individual they pertain to by using the media function available in all current genealogical databases. You do not put the documents into separate file folders. You leave them all in one huge pile on the computer and then use the computer to find the documents based on the individual and unique meta-data (extra information) about each file document. I use a program called Adobe Bridge, this lets me add key words to any file. I can also add Spotlight comments to my files using the Apple OS X operating system. Key words might include the date, time and place of the document, the names of all of the people mentioned and general descriptive words, such as probate, will, witness, etc. Then use the computer to search for the document using those key words. There is hopefully, only one copy of each document stored on your computer. You don't worry about where the document is stored, it is always in the right place, exactly where you left it and can be opened at any time. If you are going to use the computer to organize your files, you need some way to store meta-data with your files. Both Apple and Microsoft allow you to add key words to file data, but a program like Adobe Bridge is more efficient. There have been several comments in Blog posts about a news article reporting a presentation given by Curt B. Witcher, the manager of The Genealogy Center at the Allen County Public Library. Unfortunately, my access to Mr. Witcher's comment come only from a Mormon Times article by Michael De Groote. Even though I really enjoy attending the BYU Cofererence on Family History and Genalogy, my schedule does not give me the opportunity. Normally, I would not comment on a presentation I did not personally hear, but so far, I have not found a transcription of the presentation anywhere online. As reported however, I do have a number of comments and I heartily disagree with the entire premise. First, Mr. Witcher is quoted as saying, ""I believe we have a crisis in our midst," Witcher said. "We have left the care of our written records largely in the hands of disinterested strangers." He said these records include everything from birth records to tombstones — and more and more they are disappearing." Well, I disagree. Our written records have always been "largely in the hands of disinterested strangers." I also do not buy the assertion that "more and more they are disappearing." Let's take birth records for an example. Where are birth records disappearing where they were previously maintained and available? Prior to the early 1900s, very few birth records were created and even fewer of those were available to anyone outside of a persistent researcher. Presently, in more and more jurisdictions, birth records are available on the Internet, either free or for a price. I am unaware of any state in the U.S. where birth records are not available even if there are some (or many) restrictions. Where are the birth records disappearing? Now, what about tombstones (I prefer the term gravemarkers)? Some jurisdictions have been destroying cemeteries for hundreds of years. Take Philadelphia for example. My Great-great-great Grandfather, William Linton was first buried in the Fourth Presbyterian Cemetery in downtown Philadelphia back in the 1850s. He was moved at least twice and is now buried in the Westminster Cemetery. All of those early cemeteries were destroyed to build buildings. Again, losing cemetery sites is hardly a new phenomena and we certainly are not in the Dark Ages because of the past losses. Many states have a central registry for all cemetery locations and development of existing cemeteries is limited by either local or state ordinance. I agree that grave markers are deteriorating, but that has always been the case. On the other hand, there are huge grave marker databases that are preserving the existing markers. I think we are gaining ground on grave markers. Any loss of information about our ancestors is a loss. But, as I have been asked several times recently, do we really need to preserve our ancestors' junk mail? Even if they were so diligent as to keep every thing they every received? I have many of these issues myself and it is a current topic of discussion considering the amount of space we have available to maintain paper records. It is correct that libraries are limiting hours and access. But isn't this primarily a result of the downturn in the economy. Court houses do destroy records, this has been going on forever, but many state and county records are finding their way into online databases. In my own county, Maricopa, court records were almost entirely unavailable until quite recently when they were all digitized and made available free online. I do not see a threat at every turn, I actually see an opportunity. Mr. Witcher also complains that no one is writing letters anymore. From my own family's standpoint, our family is generating many times the amount of family records that we used to when we had to write paper letters. The real issue is not that people are not writing, but that what they are writing is now so voluminous that we don't know what to do with all that information. I will address the issue of preserving E-mails and Blog Posts in a post in the near future. I guess I disagree that we are entering a Dark Age. I see a lot of light and promise. Are there limits to genealogical research? Several recent conversations concerning genealogy have ended rather suddenly, on my part, when the person claimed to have his or her genealogy "back to Adam." I really don't have any polite way to respond to that conclusion. I have written before about the physical impossibility of obtaining such a lengthy pedigree, but recent conversations have caused me to return to the subject. The real question is where does genealogical research end as a practical and reasonable endeavor? Part of the complication of a discussion in this area, is the issue of the infamous genealogical "brick wall." Anytime further research is characterized as a brick wall, there is an unspoken assumption that some kind of further research involving hitherto unavailable records, will continue to extend the pedigree. The literature is replete with anecdotal examples of researchers finding the long lost relative. I have no reason to doubt that there are circumstances when additional records become available or a different research approach leads to an extension of an existing line. Often, the brick wall situations involve looking for the wrong person, or in the wrong place or at the wrong time. However, by looking at research as always open ended, you could argue that given the proper circumstances, someone really could extend their family line all the way back to Adam. Back to the question, is there a practical and reasonable end to research? Or can all barriers be overcome? Let's start with a common problem, lack of identity of a father (or even a mother) of a living person. Suppose, the individual was born out of wedlock, and in a not too uncommon case, the father is not identified in any birth record, either because the mother refused to disclose the father or because the mother may not have known who the father was. By the way, I deal with this issue regularly. But, you say, you can still research the mother's line (back to Adam or whatever). But does the identity problem really stop any further research? There may be circumstances where this obstacle to obtaining information has been somehow resolved, through DNA testing or whatever, but what if the paternity issue is more than a few years back in the past? There have been a few highly publicized cases where paternity has been "proved" historically by DNA or other means many years after the fact. But, absent a prominent historical figure, it is unlikely that anyone would commit the resources needed to overcome the lack of historical data. So, does the lack of identity of a father for a child constitute a practical or even a reasonable limit to further research. My conclusion would depend on the circumstances. In most cases, unless there is a breakthrough in record availability, the lack of identify is a limit to the extension of that particular line. A similar issue exists in the past, depending on the area of the world, with the recordation of maternal surnames. If the mother's family was not recorded, there may be a practical or reasonable end-of-line situation. In some countries, such as China and Japan, records do exist back thousands of years, but in Western Europe, information on individuals, other than royalty, are extremely scarce before 1000 AD. What I see as a problem with the failure to come to a reasonable end to genealogical research, is that the family doing the research may become fixated on the brick wall problem to the exclusion of any other research. In some cases, it may be realistic to acknowledge lack of identity of a wife's parents, as a reasonable limit to the extension of that particular family line. Some apparent end of line situations are very likely solvable. For example, the immigration problem, that is, tying the immigrant to his old world country or origin. Although difficult at times, this is an area where additional information may actually help determine the place of origin. Can I avoid the whole issue by merely tying into one of the diverse royal families and thereby gain the requisite pedigree (again back to Adam)? Well, yes, they did have descendants. But, the old royal pedigrees are not substantiated for the most part. An individual may get some satisfaction from believing that they are descended from royalty, but that is not real genealogy. (My opinion). What then is real practical limit to records that can be used for constructing a pedigree? No, I do not believe the old Court House burning problem is a practical or reasonable end to research. Yes, records have been lost, but the last time I checked, courthouses were not the only place records were kept. Yes, there are practical and reasonable limits to the extension of family lines. At some point, all lines reasonably end. Looking at the time, the place and the actual availability of records in general will give the researcher an opportunity to determine if the time and effort might be better spent on other family lines. When New FamilySearch was introduced to Mesa, Arizona back in October of 2007, one of the first things we all did was to use the dispute function to tell the world we disagreed with their inaccurate or wrong information in the file. I literally spent hours and hours searching through the files, disputing all of the wrongly included children, incorrect marriages and other issues. Over time, it became apparent that the program had no real way to make corrections. Eventually, we learned that disputing a person or a fact, locked that individual so that no one could make a change. To make a long story shorter, I began the process of removing all of my disputes for a number of reasons. Those reasons included all of the angry E-mails I kept getting from other users of the program. Once I figured out that putting in correct information merely duplicated what was there and did not provide any way to make changes to the incorrect information, I started to get rid of my disputes. Unfortunately, I think I may still have a few hiding out there in the far reaches of my family tree. Finally, we got some guidance from FamilySearch about limiting the use of disputes to certain types of problems, such as when an individual was identified with the wrong gender. Fast forward to today. As recently as July 6, 2010, there were a whole list of Help Topics on the issue of disputes. That is about to change. As stated in the June 2010 update to the Users Guide for New FamilySearch: (See Document 1016383). Review the disputes that were entered on an individual’s record. Comment on disputes. This will hopefully lead to corrections that resolve the issues. Edit or delete your own disputes. Note: You cannot delete the entire “Legacy Disputes” discussion. If all of the comments are deleted from the “Legacy Dispute” discussion, the system automatically deletes the discussion. Now, in a July, 2010 Beta Test Instruction, the comment is made that eventually, the dispute feature will be removed. In the first phase, you can no longer add disputes, but you can still see old disputes and you can edit or remove the disputes you added. "Joshua was the son of John Tanner and Lydia Stewart. He needs to be removed from the family of Joshua Tanner and Thankful Tefft." I replied, "It might be helpful if you specify the person you are referring to by using their Person Identifier Number so that the person can be found. There are at least six different sets of parents in New FamilySearch (NFS) for John Tanner, each of which is named Joshua Tanner and Thankful Tefft. See the * mark next to Josua Tanner. However, NFS will not allow these duplicate families to be combined because the number of combinations exceeds the present 250 person limit." So far, no further response. I do think the discussion mode is better than the dispute system, but who reads the discussions? Apparently, almost nobody, yet. I would be helpful to this whole process if they made reading the discussion, if any, a prerequisite to making any changes or adding any information. In any event, I for one, am not sad to see the dispute function disappear. If you check the claims made by some manufacturers of popular CD-R brands, you will see that some make bold claims indeed. Typical boasts include: "100-years archival life", "guaranteed archival lifespan of more than 100 years" and "one million read cycles". One company even says data can be stored "swiftly and permanently", leaving you free to bequeath those backups of your letter to the electricity company to your great-great-grandchildren. But an investigation by a Dutch personal computer magazine, PC Active, has shown that some CD-Rs are unreadable in as little as two years, because the dyes in the CD's recording layer fade. These dyes replace the aluminium "pits" of a music CD or CD-Rom, and the laser uses that layer to distinguish 0s from 1s. When the CD is written, the writing laser "burns" the dye, which becomes dark, to represent a "1" while a "0" will be left blank so that if the dye fades, there's no difference; it's just a long string of nothing to the playback laser. In a further article on Digital Preservation from the National Archives of the UK regarding storage media for long-term preservation, their suggestion for CD-R use was limited entirely to CD-Rs with a gold reflective layer and phthalocyanine-based dyes, since recent research suggests that these are the most stable, and have the greatest life span. The FamilyTree article does recommend the gold type CDs but does not explain the volatility of every other type of CD/DVD. What the article does not emphasize is the need to avoid technological obsolescence by verifying and, if necessary, migrating your storage media every year or so. As the FamilyTree article states, "Don't forget to transfer files to new media as they become available." It does no good to have a gold CD if you can't find a CD player that will recognize the disc format. To quote from the UK National Archives, "In situations where multiple copies of data are stored on separate media, it may be advantageous to use different media types for each copy, preferably using different base technologies (for example, magnetic and optical). This reduces the overall technology dependence of the stored data. Where the same type of media is used for multiple copies, different brands or batches should be used in each case in order to minimise the risks of data loss due to problems with specific manufacturers or batches." The UK National Archives gives a score to various media based on longevity, capacity, viability, obsolescence, cost and susceptibility. Linear Tape Open (LTR) comes out on top as the most desirable media, followed by DVD-R, Hard disks, CD-R and last Flash Drives. But in this world of rapidly changing technology, this article from back in 2008 is itself obsolete. Hard drives are much, much less expensive than they were just two or three years ago. From my standpoint, the amount of data to be archived determines the type of media. CDs hold relatively small amounts of data and very large files, such as hundreds or thousands of photos, will not fit conveniently on CDs. DVDs hold more data, but with large files or a large number of files, DVDs are still not an option. For example, one backup of my current files would take over 100 DVDs! Think how long this would take to copy. Also, there are currently fifteen different types of writable DVDs. If I had a DVD recorder that would handle the highest capacity DVDs, it would still take over 25 DVDs. There is really no good stopping place for this discussion. I guess the point of the whole post is to counsel caution in relying on any one type of backup. I presently use hard drives (the last backup took over 5 hours). I have multiple drives and periodically give each of my seven children a copy of the whole backup to keep in different parts of the country. 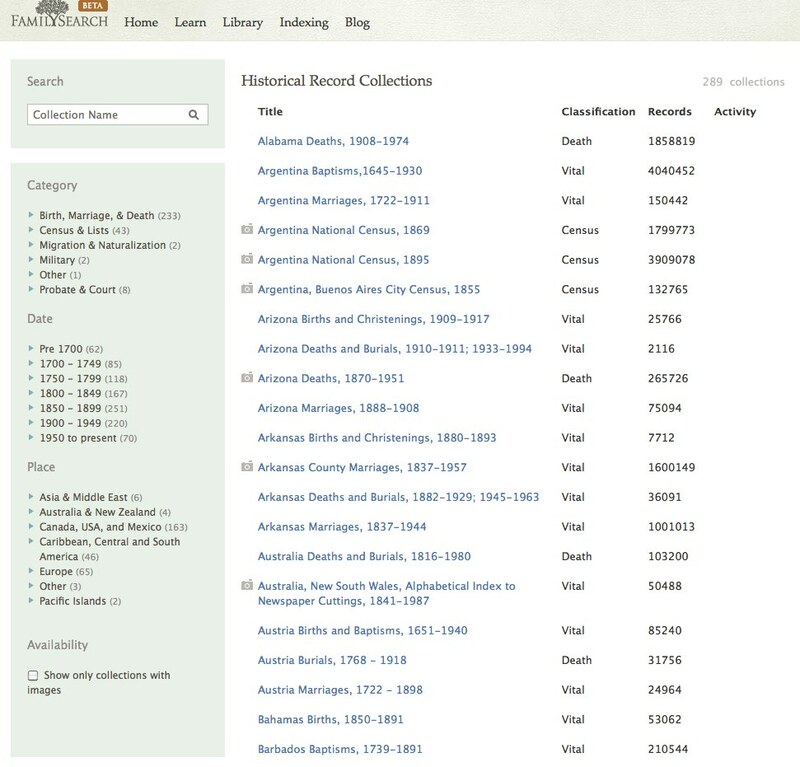 In a comment to my last post, Karen of Genealogy Frame of Mind named the activity of gathering ancestors from online databases as "Click and Claim." I like this designation. It summarizes the video game-like activity of going online and copying names down into a local database without any discrimination as to the accuracy of the information and without even knowing the identity of the individuals being added to the local file. Here is one example of information that is contained in many online databases and dozens of files (not mine, by the way). One of my Grandfathers was killed in a truck/train accident in 1944 before I was born. The accident occurred in New Mexico, but he resided in Arizona. I had never seen a death certificate and, of course, there was no Arizona Death Certificate. Although the story had been told to me all my life about his death and although I did not doubt the accuracy of the account, I still had the nagging issue of providing documentation to my file. This is the situation. Even if you "know" from your own personal knowledge the facts about your family, you cannot rely on your own memory. Why, you may ask? Because you are going to die and those that come after you will not have your memory. It is absolutely important that the video game be stopped, that accurate sourced information be passed on to the next generation (whether they want it or not). Relying on passed down, unsubstantiated, rumor or fable is not acceptable. OK, back to the death certificate. According to the story told to me and to entries made on Family Group Records from my parents, my Grandfather died in Grants, New Mexico. No county was ever identified. So, I went to the Internet and found out the county where Grants is located. Guess what? Grants, New Mexico is the county seat of Cibola County. So I began the process of searching for a death certificate in Cibola County. No luck. Why? Because Cibola County is New Mexico's newest county, formed in 1981 from the western portion of the much larger Valencia County. Then I was able to find the death certificate. Job done. Why this example? Because there are three areas where the information provided to me could have been inaccurate. It did turn out, in my case, that my Grandfather was killed outside of Grants, New Mexico in 1944. But it could have just as easily come out differently. The research here was neither difficult nor time consuming, but if this event had occurred back in the 1800s or even earlier in some other state, the death record could have been impossible to find. The oral tradition would have given no clue as to the actual location of the death record, if one existed. THE INFORMATION PROVIDED TO ME BY THE FAMILY TRADITION AND CONTAINED IN ONLINE SOURCES, WAS ACCURATE BUT MISLEADING. It was not misleading by anything my parents said or did not say, but became misleading by subsequent events. This scenario is only one example of how the information online contained in unsubstantiated databases can be pernicious and misleading. So think before you click. Genealogy is not a game, it is a serious pursuit of historical accuracy. Me: See that green arrow in New FamilySearch? Just click on the arrow. Friend: This shows that this person needs to be sealed to his wife. Me: But look, there are three wives with the same name and several others with different names. It looks like these three are duplicates. Friend: OK, so we combine all of the three names. Here we go! Me: This still shows three different wives, even though we have combined the ones with the same names. Which one is the right one? Friend: I don't know [as he copies all three names into his database]. Me: Don't you think it might be a good idea to find out which one, if any, of the wives are correct? Friend: No, I'll just copy them all, that way I probably have the right information. Believe me, no amount of explanation will change his mind. He can't be bothered with trying to find out the "correct" relationship, he just wants to fill in all the empty spots or green arrows in this program. You win the game when you have all of the empty slots filled and there are no more green arrows. If we do a search, even though he has no idea who these people are, and still find green arrows, he is off to print the Family Ordinance Request (FOR). RootsMagic is a sort of video game and printing off FORs means you are winning the game. 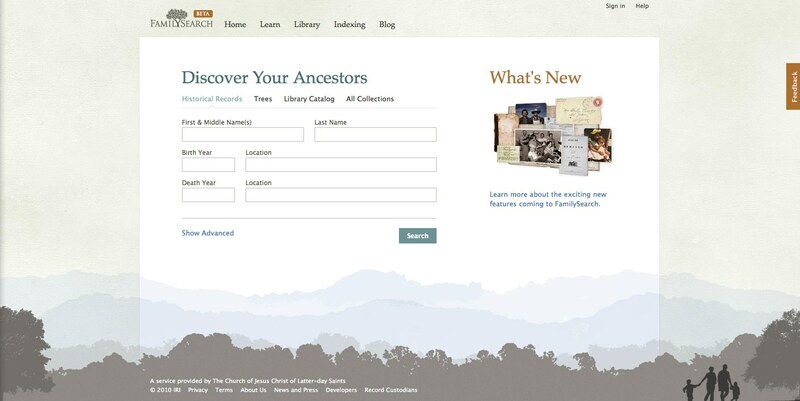 No one would consider New FamilySearch to be a primary source for information about an ancestor. But even if this is true, what about all those people who are working their way through New FamilySearch, looking for green arrows, combining names and downloading the information into their database, without even the vaguest notion of who those people are? In fact, the only information in New FamilySearch that could be even fairly considered to be a primary source is the Temple Ordinance information. Everything else is second, third or more hand copies. So where do I find a primary source? The definition of a primary source is source material that is closest to the person, information, period, or idea being studied. It may also be a historical document that was created at or near the time of the events studied, by a known person, for a known purpose. In the book, Evidence Explained (Mills, Elizabeth Shown. Evidence Explained: Citing History Sources from Artifacts to Cyberspace. Baltimore, Md: Genealogical Pub. Co, 2007) Mills states that information is judged by the informant's degree of participation or knowledge and can be primary or first hand or secondary. As limited as these first level terms may be, and as contradictory in practice, to move away from merely copying whatever happens to fall in front of you, you must begin to discriminate between the levels of believability and probability presented by the information. I long ago stopped believing my legal clients. I do not doubt that they are telling me the truth, but I do not accept what they say to me without an extensive amount of collaboration. One of the most common criticisms of attorneys is that they represent the party on the opposite side of the case who, of course, is lying. One time I was in Court and realized that the opposing party was lying, the opposing party's attorney was lying and my own client was lying! I had no idea what really happened. It amazes me that the same person that will get so upset because the opposite party in litigation is lying will copy information out of a database like New FamilySearch. I am not picking on New FamilySearch particularly, any one of the larger databases, like Ancestry.com or whatever will do. Sifting through information to find evidence is hard work. It would actually require my friend to do some research, go through a microfilm or two or look at a Website, rather than just using the copy and paste buttons in RootsMagic. Now, it is possible that my friend's ancestor really was married to all three of those women. as I have mentioned before, I had an uncle, now dead, who was married eight times, but how does he know? In this case, my friend really doesn't even know if this ancestor is really his ancestor. He has made no independent evaluation of the information online or in his own file. His first step towards accuracy will involve realizing the need to do some basic research and get to know his family. This is a step we all have to go through to start doing genealogy and not just play the genealogy video game. OK, the Tour de France really has nothing to do much with genealogy, except that for the first time ever, I have had full cable-TV coverage of the bike race. What this means is I spent an inordinate amount of time watching bike racers rather than writing blog posts. The race is essentially over on Saturday, July 24, for 2010 and so I will likely be back with some interesting stuff shortly thereafter. I am now getting used to my new iPhone 4 and I am even more impressed than I was initially. As a side note, this particular cell phone (if you can still call it that) is not for everyone. The iPhone is currently supplied only through AT&T and a required data plan, plus phone service can cost over $100 a month. We use our phones for our business and can justify the price for the convenience. I receive calendar items, E-mail and telephone messages instantly from my office. Essentially, our entire office, with some notable exceptions, has converted over to iPhones. The iPhone 4 has a solid feel to it. It weighs only slightly more than the old phone, but seems like it is more solidly built. But how will it help me with genealogy? I already mentioned the increased resolution of the built-in camera, to 5 megapixels, but there are a lot of other benefits. One of those is a selection of Apps for maintaining your genealogy files on the iPhone. I use Reunion on my iMac and have taken advantage of the mobile version of the program. I can have my entire database at my finger tips. I also have several other genealogy apps on the unit. Now, let's suppose I go to the library to do some research. I take my phone. When I find something in a book of interest, I take a picture of the page. When I need to add something to my database, I have the mobile version on my phone. If I need to look online and don't have access to a computer, I have Google at my fingertips on the phone. On and on and on. In short, the iPhone is a general use tool, really a small but very powerful computer only limited by its small size and the available software. Of course, I could not do much typing on an iPhone (I am not a text master) and there are other physical limitations, but having a computer you can carry in your pocket was not even something I dreamed about when I was young. No one really thought that computers would become that small and that powerful and that pervasive. What about the Android phones? Yes, Google is giving Apple a run for the money. No one company really has a complete lock on small phone/computers. I like the idea of Google pushing Apple to keep innovating. I also like the idea of having options. Since the new iPhone 4 comes with both video and still imaging, I imagine that YouTube will probably get even more uploads as the phones begin to proliferate. Since there was such an increase in photographic quality, I checked out two of my favorite Apps, RedLaser and SnapTell. RedLaser reads any kind of UPC symbol and looks up the results online giving you an instant price comparison for the product. SnapTell does the same thing with ISBN codes on books, CDs and other media. I guessed right, the new higher resolution camera makes both applications much faster and easier to use. When I got my first Apple II computer, I did not image the uses I would have for the machine. With each new computer, the possible uses have continued to expand. I am sure with the capabilities of the new super phones, we will be able to do things we presently cannot imagine. There are still a significant number of people who use only paper copies of their genealogical data. The reasons for doing so, run from a lack of computer knowledge, to comments about being better able to visualize the information on paper. I have long since learned that I do not get into discussions with these people about using computers. It is not productive. I was very early in adopting computers for my genealogy, using an Apple II with a dot matrix printer. It seemed to me that given the amount of information can more than double in each generation, there was really no way to keep track of all those people, dates, places and facts without either using a strict organizational structure or letting a computer do the organizing. Of course, my Great-grand Mother never had the opportunity to use a computer. Everything she did, she did by hand or by typewriter. As an aside, I was showing one of my grandsons a picture of a typewriter and he didn't know what it was. Back to Great-grandmother and her genealogy. In going through all the work she did for over thirty years, it became apparent that she repeated several of the lines more than once. There were as many as four and five copies of the same material in her files. Even today, with very advanced computers and programs, I still have some duplicates. But, why do I use computers? I could answer like George Mallory, the mountain climber, because it's there. But the real reason is more practical, computers enable me to process the huge number of individuals that make up my database. Our family's genealogical efforts go back several generations and I have inherited a good portion of all the previous work. Quite frankly, without computer assistance, I would never have completed even a first level survey during my lifetime. Circumstances have given me the option of using some very sophisticated computer hardware and software for the past twenty years or so. On a recent visit to one of my wife's elderly cousins, a former Accredited Genealogist, the cousin showed us some documentation she had accumulated. Because I had my digital camera handy, with her permission, I was able to make high quality copies of the information on the spot. This ability to gather high quality copies of information is a hallmark of the digital age. My present document file contains over 78,000 items, including photos, scans, and documents of every possible description. There is simply no way that I could handle that huge amount of paper. Some of those items have hundreds of pages. My photo archive alone has over 56,000 images. Let's assume that I wanted to preserve each of those photo images on paper (or other suitable medium) that would be 56,000 pages or 100 volumes of 560 pages each. If I took the photos and put them into archival photo sleeves, it would cost over $46,000 just for the sleeves. (From B& H Photo) You can see why I put a premium on moving information digitally. Now, back to the paper world. Given a good indexing system, like those used by larger libraries, even a paper system is workable. But you have to put the paper someplace. My entire files can be put on one hard drive about 4 inches square. I can carry my entire database with me where ever I go, if I choose to do so. Given a reason for doing so, I could transfer my whole database of files to another person in a matter of a couple of hours of copy time. (By the way, I give backups of all my files to each of my children periodically). All of these reasons are why I use computers for genealogy. Surrounded by controversy in the media, the new Apple iPhone 4 has already sold millions. From the pre-release hype, it appeared that the new phone would be a substantial upgrade from my old iPhone 3G. When I returned from my family reunions, the new phone was waiting for me. Switching to the new phone was very simple but took hours of watching files backup and transfer. All of the Apps and data on the old phone had to be backed up to my iMac. That is a lengthy process which usually takes more than an hour. Once the backup was complete, I had to transfer all of the Apps and data to the new iPhone 4. But wait, first, I had to update the operating system on the new iPhone. There has been a substantial upgrade of the operating system since the phones were manufactured and sent out. Once the upgrade was done, all of the Apps and settings came over to my new phone. Did I say all? What I really meant was all of the Apps came over and I had to do all the settings and log into all the accounts again. The new iPhone 4 is slightly thinner than the previous models but weighs a little more. The added weight is not noticeable, but the thinner case makes it feel more hefty than than my old phone. The first thing I noticed was the upgraded screen. It is much higher resolution than the previous models, 960-by-640-pixel resolution at 326 ppi. Pictures on the display beautiful and text is easier to read. I didn't really see any problems with my old phone, but the new one makes the old one look pretty shabby. I haven't had any significant issues with AT&T service even though the media has made a big to do about dropped calls and etc. I have had both Verizon and AT&T and haven't seen that much difference from day to day. In my experience traveling across the country, Verizon has somewhat better connectivity but AT&T seems to work fine most of the time. I chose to stay with AT&T rather than wait and see if Apple adds Verizon as an option. At 5 megapixels, the camera is now at least adequate for copying documents or other uses. The main limitation being memory storage space on the camera. But in situations where I can't haul in my large Canon camera, the iPhone's camera will now be an acceptable substitute. It is easy to see why the iPhone 4 has already sold so many units. It is a fantastic machine in an amazingly compact case with vast computer capabilities. This last two weeks we have had three family reunions, all in Salt Lake or Utah Valley. The Linton Family Reunion was the second one held. The last one took place five years ago. Over 200 people came to the two day affair. The second reunion was the Wessman family with about 80 people present. The last was my own family with 42 family members present for a week of dinners capped by a campout over three days. The reunion with the most logistics and planning was the Linton Reunion. Relatives came from as far away as China. I wrote about this reunion in my last post. For those of you who do not know, Utah Valley lies to the south of the Salt Lake Valley. There are a number of small towns including Orem and Provo, Provo being the home of Brigham Young University. The second reunion was more informal. The Wessman family got together at one of the houses and had an extended pot luck dinner on one night. The Reunion was in Salt Lake City and many of the attendees had made extensive travel arrangements, coming from Wyoming, Idaho, Pennsylvania, Florida and Texas as well as Utah. Fortunately, all of the main (read parents with children) family members had land lines, cell phones and/or E-mail. Coordination of the food and arrangements were done in advance electronically. During the dinner we set up a computer with our genealogy program running and each of the families came by and we updated the information on each family. Our immediate family is spread all over the U.S. As they were able to do so, my children and grandchildren also attended the other two reunions. Some of those furthest away flew but some drove long distances to attend the week long activities. Food was a most pressing topic, but all of the arrangements were done in advance using telephone or E-mail. In keeping with the informality of our family, we decided some of the activities at the time they occurred. The biggest part of the reunion was the camping experience held at a Utah Valley campground. Some of our immediate family members had not seen each other for five years. Reunions are valuable ways to reconnect with family members. Many of the babies born in our immediate family had never been seen by some of the family members. Many of the children could not remember their cousins from previous years. It was important to see the changes in the families and to connect the grandchildren with the grandparents. One of the most difficult things about representing a client in a jury trial is the process of objecting to the admission of evidence under the Rules of Evidence. The legal Rules of Evidence are designed to help the trier of fact, either a judge or jury, to make a just decision in a case. There are are lot of parallels between the consideration of evidence in the legal sense and in the context of genealogy. So how then do the legal Rules of Evidence apply to genealogical research, if they do? This topic was suggested by a comment from a fellow attorney concerning one of my earlier posts. In the United States, the Federal Rules of Evidence provide a framework of rules governing the admission of testimony or other evidence to establish the facts of a case in the federal court system. The Rules of Evidence are a relatively recent development in the law and date back to 1975, the year I was admitted to the Arizona State Bar to practice law. The various states have adopted similar rules since that time. There are two parts to the law in a trial, the legal principles involved commonly referred to as the law, and the facts or evidence in the case. This distinction between law and facts is one of the most difficult concepts to understand about our legal system. Essentially, the Judge decides the law and either the judge or a jury, depending on whether the case is tried to a jury, decide the facts. To give a somewhat simple example, a fact might be whether or not one of the parties paid a debt owned to another party. The law of contracts would then be applied to that fact to determine if the court would award a judgment to the party owed for the amount of the debt. I could get really lengthy at this point, but let's just say that facts are important. In my previous example, if the debt turns out to have been paid, then all the law in world is not going to help obtain a judgment. The rules of evidence operate as the gatekeeper of the facts, hopefully, letting only those facts into testimony in the court that will help the jury or judge decide the case properly. I realize that there is a lot of skepticism about the efficacy of the legal system, but all in all, the system works. In this sense, the rules of evidence are totally irrelevant to genealogical research. As researchers, we certainly do not want to have evidence of any degree of relevancy excluded from our consideration. Even seemingly irrelevant facts from third and fourth hand sources can be of help in solving genealogical mysteries. So why then do we talk about evidence rules in genealogy? Because not all evidence is created equal. The rules of evidence are designed to filter out facts that would mislead or be inaccurate. Likewise, in genealogical investigation, we would like to know whether or not a conclusion made by someone about a relationship or historical fact can be relied on to be correct or not. By providing a source for information obtained, a researcher allows others who examine the information at a later date, to determine the reliability of the information. Lack of source reference renders the genealogical information practically useless to subsequent researchers. This is especially true in situations such as those created by online family history aggregators. Contradictory information is rather common in the larger sites that allow individuals to upload their family trees. Absence of evidence, i.e. source citations, is rampant. Acknowledging that we already have a rather highly developed system of determining the reliability of evidence in our legal rules of evidence, understanding the basis for these rules allows us to be more precise and reliable in our own use of genealogical evidence. Obviously, there is no judge in genealogy, other than the passage of time and subsequent research, but sloppy research with a lack of sources should be ruled inadmissible by any standard. Another example, there are rules about admitting hearsay as evidence in court. Hearsay, simply put, is second or third (or more) hand information. The further removed from the original source, the more unreliable the information is considered to be. This past week we were able to attend a family reunion for the family of one of my Great-great grandfathers. This reunion for the Samuel Linton family was well attended with over 200 people gathering in a park in Orem, Utah. Samuel Linton was an 19th Century immigrant to Philadelphia from Ireland. It is likely that his ancestors immigrated from England to Northern Ireland in the 1600s. Samuel joined The Church of Jesus Christ of Latter-day Saints and traveled across the Plains to Utah, settling in Nephi. My Great-grandmother was his daughter Mary Ann Linton. This was the second reunion for this large family. It is estimated that Samuel has more than 1000 descendants and we were thrilled to get more than 200 of them together at one place and time. Like any good reunion there was food and a lot of talk. One of the oldest living descendants, 91, related his early experiences in the family. Many of the older individuals had extensive recollections of living in Nephi in the early years. The night before the gathering in the park, many of the adult members of the family met for a dinner at the BYU Wilkinson Center Skyroom. There they presented various PowerPoint reports and histories of the families. Most of the genealogical information was graphically illustrated with a 60 foot long descendancy chart. There were also exhibits of old photographs and other objects. Most importantly, the family members who came from as far away as China, were able to meet each other and form a sense of family. Many of the members of the family are actively involved in research and it was a good time to begin to coordinate the family organization and attempt to avoid needless duplication. In my own family, my daughter was one of the acknowledged "experts" on the family, so it was a good venue for people to share ideas and talk about research issues. One of my relatives turned out to be a former director of the Utah Valley Family History Center and we had a good talk about the challenges of New FamilySearch. Not all families would have the energy or resources to have such a large and successful gathering, but even if the only meeting is a pot-luck in a park, the reunion gives younger family members a sense of family they may never otherwise have. I once calculated that I had spent more money on computers during my lifetime than anything else, including houses and cars. I say that because of the financial commitment that is involved in keeping both hardware and software updated from time to time. It is unrealistic (and wasteful) to upgrade too frequently, but technology is one of the many rapidly changing aspects of our current society and changes in computer hardware and software happen regularly and unrelentingly. The history of one company's microprocessors, Intel, are on an Intel Quick Reference Guide. Beginning in about 1988, Intel introduced one or more new processors every year! The processor used in my previous PC Desktop was released in 2002, the Pentium 4. Not every incremental new release of a processor makes any noticeable difference in the user experience, but over time, the difference in today's computers compared to those two or three years old is remarkable. Now, as an aside, if you are primarily working on Personal Ancestral File (PAF) and using a little word processing and perhaps some E-mail, a ten year old computer might work just fine for you. But if you are integrated into the Internet i.e. Facebook, Video Conferencing, etc. you might just find that updating your hardware will make a tremendous difference in your productivity and your online experience. Back to the hardware issue. For me, the benchmark program is Adobe Photoshop. Since we operate a graphics design business, (in addition to other businesses), there is constant pressure to have the work flow proceed faster and more efficiently. In genealogy, I have a similar issue, with a huge number of digitized files, any of the older systems are unacceptably slow. I have always used Apple Macintosh computers for that reason, speed with graphics. I know that there are PC systems out there that can claim to be faster than some of the Macintosh computers but the current 2.66 GHz Intel Core i5 iMac is the fastest computer I have ever worked with and the 27 inch monitor is spectacular. Right now, I work on a number of computers, I have PCs running Windows XP, Windows Vista and Windows 7. All my Macs run Snow Leopard, Mac OS X 10. I recognize that Windows XP was considered a "good" version of Microsoft's operating system and that Vista has some problems. There were a lot of users who rejected an upgrade to Vista from XP and a lot of those users are still running XP on their systems. Windows 7 has generated very little controversy and seems to be a workable upgrade. However, there is one big drawback, most of the existing software running under XP has to be reloaded after an upgrade to Windows 7, requiring those who upgrade to dig out all their old registration numbers. As is usual with a major operating system upgrade, many existing programs, without a contemporaneous upgrade from the software company, will not work with Windows 7. Apple has the same issues with various versions of its operating system. The latest system, Snow Leopard, is also generating very little controversy. But, at the same time Apple has discontinued support for its older PowerPC computers. The older computers will not run Snow Leopard. Everytime there is a software upgrade, there is a trade off. You can only fit so many of the puzzle pieces together and some software gets lost in the upgrade and new software comes along to replace it. It is a given fact of life of the computer world that users will be agravated by having to pay for software and hardware upgrades. The same people that will go out and buy new clothes to stay in fashion, or a new car to replace an older failing one, will grouse about having to upgrade their computer hardware and software. On the other hand, computers and the software to run them are expensive and to a genealogist on a budget, any upgrade must be carefully considered. One of the most common statements made to me during my contact with genealogists, is "I don't know a whole lot about computers." Learning about computers and software can be as interest intensive as genealogy itself and most genealogists, I find, make the decision to focus more on genealogy than on learning about computers. They rely on a conglomeration of family, friends, associates and professionals to set up their computer systems and keep them running. It is common that the genealogist relies heavily on an experienced computer professional within their family to help with setting up the computer. Unfortunately, computer expertise and a good genealogical background seldom go hand in hand. I have the good fortune to work with both very experienced genealogists and computer professionals. One thing I have learned from this association is that the computer professional usually vastly over estimates the computer needs of the genealogist. I see people with computer systems that are extensive and way more computer power than they need. Some of the least expensive off-the-shelf systems available through many mass merchandisers are more than adequate for the average genealogist. Choice of a computer system should be driven by need, not by what your nephew, the computer whiz, would like to have for his own computer. On the other hand, I see a significant number of genealogists who are struggling along with a hopelessly outdated system. I am certain that the main reason is a lack of finances. A new computer is not considered a necessity and those living on a very low fixed income cannot afford to buy the latest and greatest. I would propose a middle ground. Talk to your family. Let them know about the genealogy work you are doing. Watch and wait. It is likely that one of the computer experts in your family will be upgrading their system soon. It is no disgrace to ask for the old system. Their old system may be many generations newer than the one you have been using. We have "donated' our old system to those in need of a "newer" computer and this works really well. Most used or older systems have little or no value on the market, and therefore, you can pick up a good deal. Be careful that the old system is not being dumped because it is fatally flawed, but in most cases the old system can function a well as a new one of the same age. If you have a family organization, you may wish to start an old hardware exchange to make sure the genealogists in the family have an adequate system to work on. If the family organization is a Section 501 (c) organization, the contribution could be tax deductible if handled correctly. Unfortunately, software does not always work the same way. Most programs are registered to the original purchaser and buying or obtaining old software copies is not always a good idea. But other than an operating system, most of the other software that might be used by a genealogist can be obtained for free from the Internet. The other major expense in taking advantage of today's online world, is a network connection. This can be a major expense for a low budget family and there aren't too many ways to cut this cost. But you might try a bundled network connection with a cable provider or some other such arrangement. If you really want to take advantage of all of the vast amount of online information presently available, you can also use a computer at your local library or Family History Library. The most glaring omission from the list is any reference to an operating system, which I assume he meant to include in the hardware section. I don't really care that much about hardware, it is only a tool to run software. If I need to do something that my present computer does not do or run software not supported by my present system, I upgrade to new hardware. Since, as you will see below, all of my computer usage is integrated with several business entities, we buy new hardware all the time. For example, I will shortly be upgrading to an iPhone 4. I know I cannot cover all of that in any one post and I will have to turn it into a series. It will probably take several posts to cover the items because I have reasons for using or not using almost everything in the list. First of all, and from a technology standpoint, I am securely in the Apple Macintosh computer camp even though this particular post is being written on an HP Laptop. Some of the items on the list are more or less irrelevant to Mac usage. I have also been involved heavily in technology and specifically in computers since about 1975 (actually earlier) and I have my own "meme" that I have inherited from literally thousands of other techs throughout the years. I spent years doing onsite computer support and setting up networks and still help people with hardware issues from time to time. Now on to the first item on the list: Computer Hardware in which I also cover operating systems. I currently use, either directly or indirectly, about six computers (not counting my huge computer network), three of them are Macs and three are PCs. Between my wife and I, we are involved in about six different businesses including a law firm, a graphics design business and others. All of these entities are essentially computer based. My law firm alone employs about 65 or so people and has a huge involved computer network with online access. My genealogy work has, from the very start, been heavily computerized and technology involved. I have tens of thousands of documents gathered from hundreds of sources including family photos. Manipulating all of the graphic material I use takes a lot of storage and computer power which often drives the addition of faster hardware. I do not become attached to anyone computer or operating system, because of the frequent upgrades. The six computers include two iMacs, 1 HP PC, 1 generic PC, and an HP Laptop with a 17" screen. We also have an iPad, an iPhone, an iPod, and a whole lot of other devices. I will move on in the next post, or so, to more specific hardware issues as they relate to genealogists. This past week or so, I was helping one of my friends with research in Arizona (of all places). Arizona is an interesting place to do research, mostly because of the kaleidoscope of people who have come to the state from all over the world. He was trying to find dates for a Great-grandfather who had come to the state from somewhere else and had died in Arizona. His focus was on a marriage date and to find valid birth information, including a place, if possible. He had the usual story about the family searching for this individual for years and concluding that he couldn't be found, and certainly, it would be impossible to find the correct names of his parents. To compound the problem, his Great-grandfather's surname was Brown. The first thing we did was to look for a death certificate in the Arizona Genealogy Birth and Death Certificates website. The ancestor's given name was Samuel and so we did a name search. Guess what? No results. One thing I have learned is that a lot of people are not too particular about spelling. Apparently, all of those family members searching for all of those years hadn't tried looking under the surname without a given name. After scanning the list for a while, we found him with his name "Samual Lamual Brown." Sort-of like Samuel Lemuel Brown, don't you think? Of course the Death Certificate gave his wife's name, Serna (sort-of like Serena) his birthplace in Oklahoma (the family always thought he was born in Texas and so forth and so forth. Well, with a little more information, we began to see if we could find a marriage date and place. We soon learned that he had lived in Cochise County. The county seat is Bisbee, Arizona and so I suggested that my friend call down to the County and see what they might have for him. I have had a few legal issues to resolve in Cochise County and I happened to know that if you call the county they are very willing to help. My friend called down to Bisbee. The next week when I saw him he was so excited. He had called the Clerk of the Court and had immediately located the marriage license, which the Clerk e-mailed to him. With a few more phone calls he found his ancestor's employment records, his tax records, his membership in the Fraternal Order of the Eagles and many more records. Could it have been a problem with a misspelled first name that stopped the family from finding Samuel Brown all these years? Yes, that could have been it. It is also likely that records are becoming more and more available. But because Samuel's name had been misspelled, or maybe not spelled the way his family expected it to be spelled, he had remained hidden for years. It is also a good lesson to learn, use the telephone to call to the record keepers. They just might not have a lot to do that day and be willing to answer questions and even send copies of documents. The main part of the page contains a number of links. The Home link is self explanatory, it takes you back to the startup page. 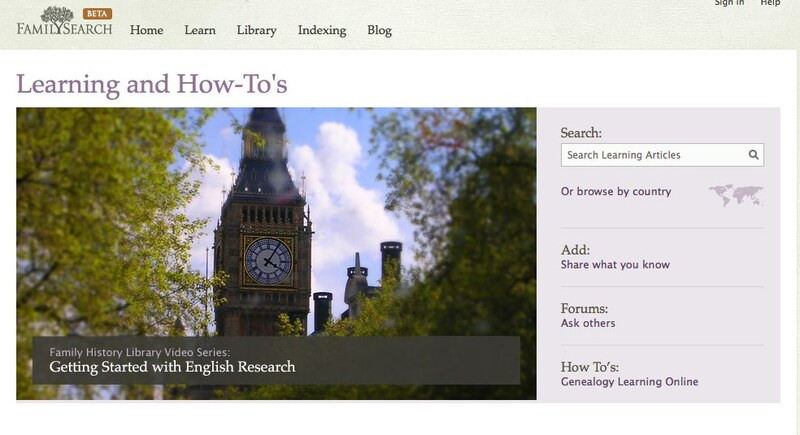 The Learn link is connected to a page with further links to the records now in RecordSearch Pilot (or FamilySearch Record Search), a link to share what you know, a link to forums and to learning online which includes the video classes from the FamilyHistory Library. As you can see by navigating the site, most of the existing FamilySearch websites are more or less integrated into this new layout. Signing into the Beta site takes you to the LDS/FamilySearch sign-in page, but signing into the Beta site doesn't automatically sign you into Forums, for example. It isn't clear what signing in does for you at this stage. 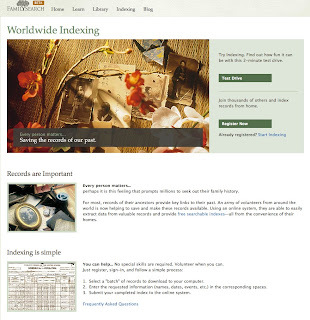 The search part of the Home page (see above) gives you a rather extensive search of all of the older FamilySearch resources, such as the Ancestral File and International Genealogical Index (IGI), and links to additional resources not previously connected. The Library Catalog search does give you the option of searching for place names, surnames and a lot of other options. You can limit your search by category, date, place and availability i.e. showing only collections with images. 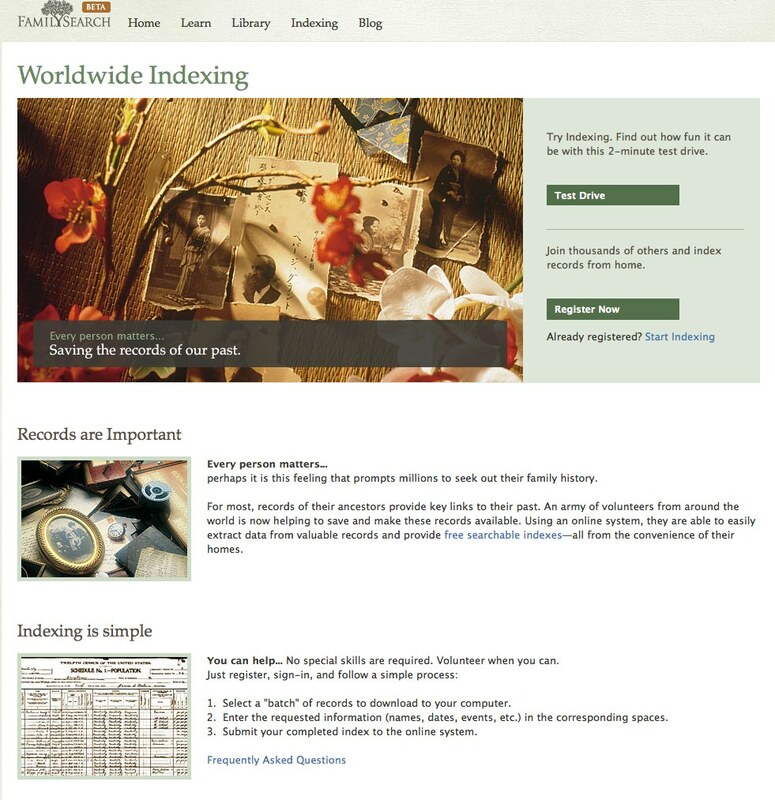 There are links to FamilySearch Indexing and to a Blog. Indexing is the engine that is driving the whole machine right now. It is only through indexing that additional records with indexes are being added to Record Search. The Blog link is apparently also in the experimental stage, the number of posts is extremely limited. It is not clear if the Blog will become a venue for news or simply a way to explain features of the website. There are obviously a whole lot more features to the Beta site. I suggest exploring the site and then sending in some feedback. There are certainly features that need to be better thought out and right now a few very circular links that lead nowhere, such as the What's New link that takes you to a page with no information and then back to the startup page. But overall it is an interesting concept site but does not obviously provide all of the features of the older FamilySearch.org site, yet. One of my friends got a new netbook computer and I was helping install software and such. She handed me a about eight or nine flashdrives. Each one had a different set of data files. We went through all of them looking for Personal Ancestral File (PAF) files to copy onto her netbook. I realized that I was seeing a repetition of what used to happen with floppy drives, only now there is much more information to duplicate. Unfortunately, she had no idea of which was the latest copy of the file and whether or not the files contained all of the names she was hoping to preserve. Over the years I have faced this problem over and over. Which of all my files is the most recent? Do I really need all of these copies of all of these files? Why doesn't the file I am looking for seem to be on any of the storage devices I am searching? Genealogy files on the computer are, after all, just files. Almost every program that generates a file, from word processing to spreadsheets, can create the same set of challenges. So what do we do to get some measure of control over all these files and copies of files? First and foremost, you need to have a consistent naming convention. That means, name you files the same way all the time. Second use names that mean something. Five files named "genealogy" doesn't help a lot with remembering which file you used the last time you worked on it. Both Windows and Macintosh operating systems will support extended file names. From a practical standpoint 128 characters should be a maximum, but it you use the same name for more than one file, you are asking for trouble. If you are making backups or copies of a file, you should also find a way to incorporated a date into your file name, usually the date the file was created. It is true that the operating system will show you the date the file was created, but in Windows, for example, the date will change to reflect the last time the file was opened or changed. That may help or it may not depending on circumstances. With my friend's files, knowing the date the file was created didn't help her at all. Most of the files were so old that the time of creation was meaningless. The only way to get out of that situation was to open each file and compare the contents. There are technical tools for comparing certain types of documents, especially for programming purposes, and these programs also exist for comparing two genealogy files. But in the case of my friend, we didn't have the program available and since there were only a relatively few files, we weren't going to buy the program for that limited one time purpose. It is comforting to know that there are programs to compare two unrelated files. One program is GenMatcher 1.08. There is a free demo program and the full program is $19.95. What else can you do to avoid the problems of multiple files on multiple storage devices? How about keeping a master working file and making periodic backups, but always using just the master file to add information. Some programs, like RootsMagic To Go, facilitate keeping a master program of your family file by providing a way to synchronize a portable version of the file with the master file on your main computer. I try to keep all of my data files, from genealogy to word processing in only one file folder on my hard drive. That way, I don't have to look around for the latest version of my master file, it is always in the same file folder with the same name on my maid hard drive. If I make a copy of the file, in any way, I put a date on the file copy. I now know that any file with a date is a copy of an original file in my main document folder. I know there are a lot of practical and some elaborate file naming and organizing schemes out there. I like to let the computer do its job and let me do my job. What good is it to have the tremendous organizational and search capabilities of the computer if you do all the work organizing the files or essentially duplicating a paper system on the computer. However, file names and dates are crucial to identifying the files so they can be found by the computer. I was reminded of a perennial problem when I started up one of the computers in our LDS Stake's Family History Center and saw "Windows 95" appear on the computer screen. The problem or challenge (or learning experience as they called our tests in High School) is keeping our equipment and our software, particularly operating systems, up to date and reflecting current conditions. Let's just say that among other problems, older Windows versions each had their random access memory problems (RAM). The summary of this problem is that for Windows 95 systems, in reality no more than 1 or 1.5 GB of memory was addressable and Windows may not even start if more than that amount of memory was available in the computer. The amount of memory the computer can address is determined by both the physical limitations of the processor and the operating system. Although Intel 386 processors could theoretically address 4 GB of RAM, the typical RAM limit was 32 MB. To give some perspective, Mac OS X 10.6 has a 64 GB RAM limit but the Core 2 Duo processor can address 256 TB of RAM. Translated into English this means that older computers and older operating systems were and are considered very limited in today's Web based world of graphic applications. If you would like to see a comparison of memory usage see "Road to Mac OS X 10.6 Snow Leopard: 64-Bits" from the AppleInsider. OK, you say, so what? I don't use any graphics applications. Umm? 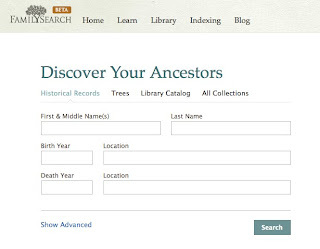 What about FamilySearch's Record Search application. Maybe you didn't realize that Record Search uses the latest version of Adobe's Flash, a multimedia platform that is popular for adding animation and interactivity to web pages. Some of the most productive searching we now do on the Internet involves images of documents, including U.S. Census records, in order to view these documents online, all of the components of your computer systems need to support some of the latest innovations in graphic technology. Absent those upgrades, your system may work either very slowly or not at all. My last computer was not that slow, it was an Intel Pentium 4 but I was noticing a decided slow down with all of the graphic intensive programs I was using. I tried increasing the RAM but that only helped for a short time. With all the work I do online, I finally bought a much faster computer. Maybe I can give an example from my distant past what it is like living with a slow machine. When I was in high school, our family owned a stodgy 4 door, 4 cylinder car. This car would likely do 0 to 60 in roughly 2 to 3 minutes. Even is those slower, older days, it was a menace to drive on the highway. Top speed was just over 60 mph (downhill) and that was when Arizona had no set speed limits on most of the highways. In other words, if I was going 55, there was no acceleration at all. Nothing. Now, what if I had kept the car? Where could I safely drive that car today (no seat belts, no air bag, etc.)? Using a computer with Windows 95 is sort-of like driving a our old car would be today on the freeway in Phoenix where the traffic moves considerably faster than that car's top speed. But, you say, I can't afford to upgrade either my computer or my operating system and anyway I would have to upgrade my version of Microsoft Word 95 also. (Why am I even worried about talking to this person? Oh, I remember, there is a copy of Windows 95 on the computer at the local Family History Center). Many people spend more on soft drinks at the local convenience store over a few months than the cost of a new really fast computer including a newer operating system. Also, there are now free alternatives to buying an expensive office suite (word processing, spreadsheet etc.) For example, an HP Phenom 8400 Desktop Computer System is on sale for $479 including the monitor, keyboard, mouse and Windows Vista Home Premium. OK, you might find a better deal than that! You can also use a free office suite, such as OpenOffice. Now, where were we? Upgrading computers and software. One of the common questions I received when I teach a class on any of the newer genealogical database programs is "Don't we have to pay for that program and how much do we have to pay for upgrades?" Why do you think that Personal Ancestral File (PAF) has not been upgraded since about 2002? Why do you think PAF is free or nearly free? If I made my living writing software for genealogists, why would I rewrite my program for a new Microsoft operating system if I could not charge for all my work? There is a huge online movement of people who believe that we all "deserve free software." Maybe I will write a post on free software issues, but for right now, the question is should I use proprietary software and if so, should I upgrade the software? I think both answers are yes, but the reasoning will have to wait to another day. My perspective probably comes from using software in a business environment where I can't sit around and wait for someone to develop a "free" software program that will perform the complex tasks involved in a law firm or graphics design business. So let's say you buy a program like (fill in the blank) and then Microsoft or Apple comes out with a new operating system and your program no longer works with the new system. You may grind your teeth a little (or a lot) but if you want to continue working you have to come up with the price of the software upgrade. I suppose you could drop out of the system and stop using computers and go back to a paper based system, but in our present genealogical work environment, computers are very useful and necessary tools. Just as I "need" a newer car than my old sedan from the 60s, I need to have an operational and functional computer system if I want to continue to work through the massive amount of family history sitting in boxes in my house. So, bite the bullet, you need to upgrade your computer and your software. If you don't you may never realize the advantages you are missing.